…yet another excellent production from Shakespeare At The George. Did you know it is our diamond jubilee this year? 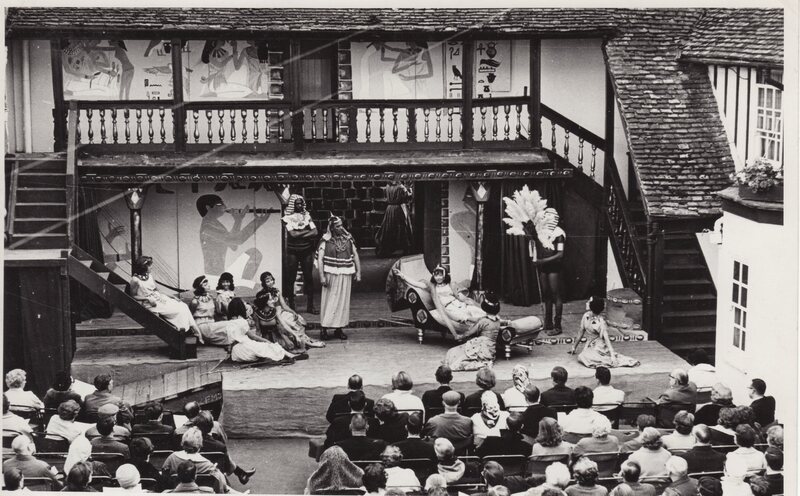 Shakespeare at The George has been performing open-air Shakespeare productions at The George Hotel, Huntingdon since 1959. Our venue for each of the last 60 years – the courtyard of the hotel – is a genuine Elizabethan setting, built in 1574 when William Shakespeare was 10 years of age. 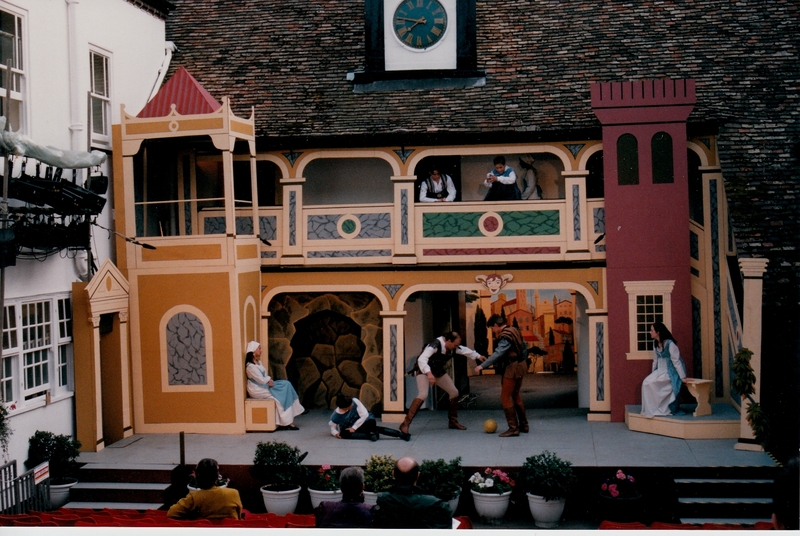 The courtyard and balcony are representative of the type of venue that would have been used in Shakespeare’s time and indeed has been used for hundreds of years by travelling players. 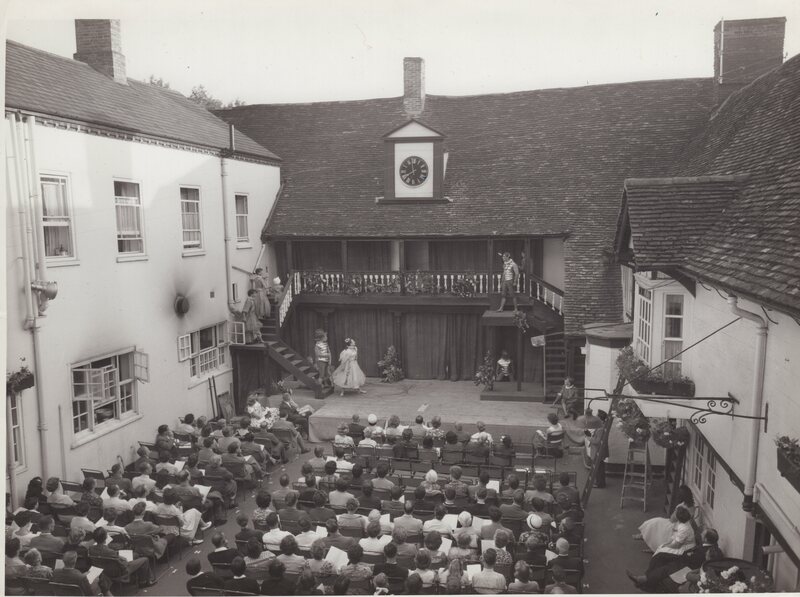 Although much of the building was later destroyed by fire, the arch and balcony (which is used in all our productions) overlooking the courtyard was saved. 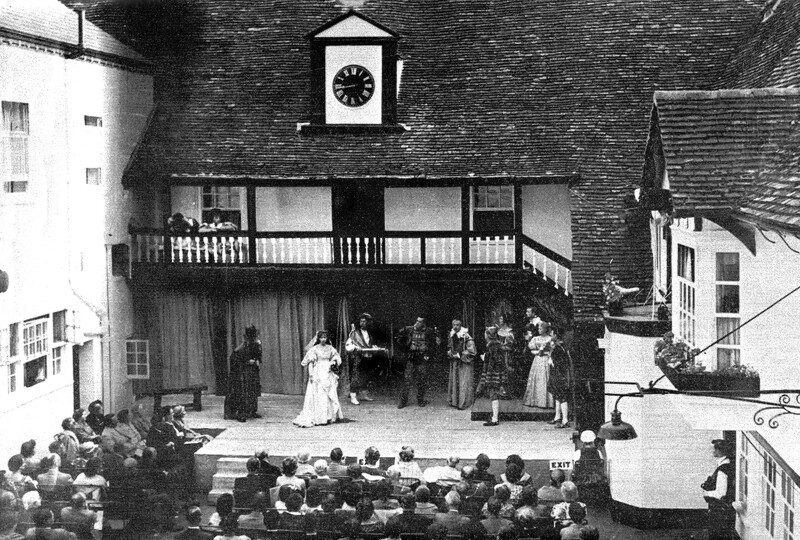 The first SaTG production in 1959 was at a time when there was a thriving amateur theatre culture in the area. The layout and ambiance of the George was considered by many to be perfect for Shakespeare and it was a coming together of people from many different groups that achieved this. 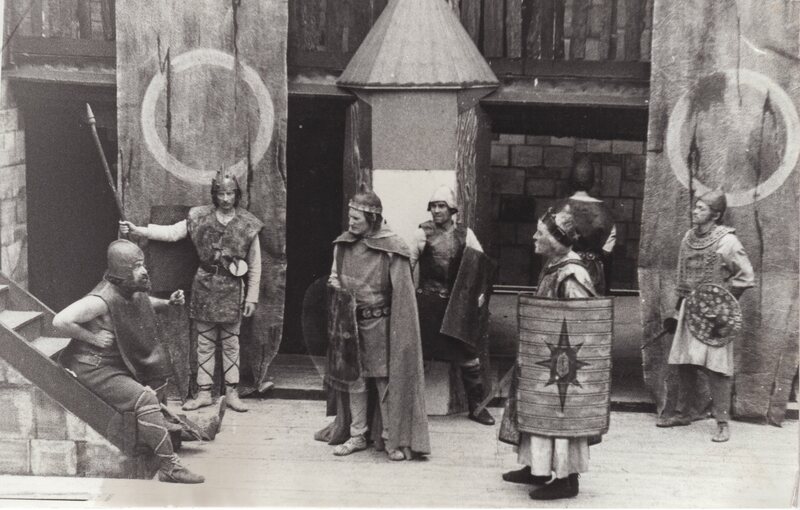 In the early days there were no dressing rooms and the actors would change where they could, i.e. the car park, or arrive at the theatre in full costume. There was no raked seating, a rowdy bar that opened directly into the Courtyard and no ring road so all the traffic thundered past. Despite this (or perhaps because of it! ), it immediately proved a very popular venue. Today we are far more comfortable with dressing rooms, professional staging, light, sound, hearing loops and even ‘StageText’ which impressively manages to sync with the action on stage to a visual word display over the stage, even when the pace varies, without being intrusive to the action below. The Great British climate has always been a challenge for outdoor activities and at one time St Peters School was used as an alternative wet weather venue. 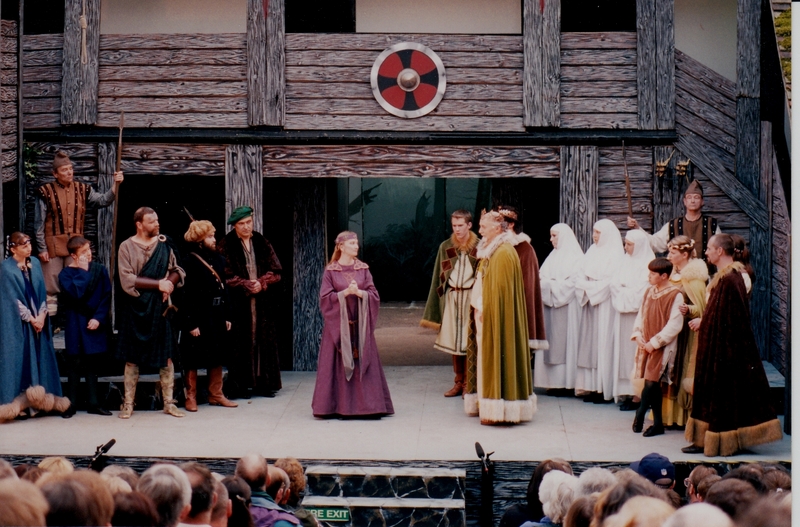 This involved the set, crew, actors, costumes and not least the audience to relocate some distance away – sometimes half way through a performance! Happily in 1997 All Saints Church, just across the road from The George, opened its doors to the company and allowed a stage to be built and seating to be arranged – providing a far more convenient wet weather venue (although due to its refurbishment we have once again been at the mercy of the weather for the last few years). 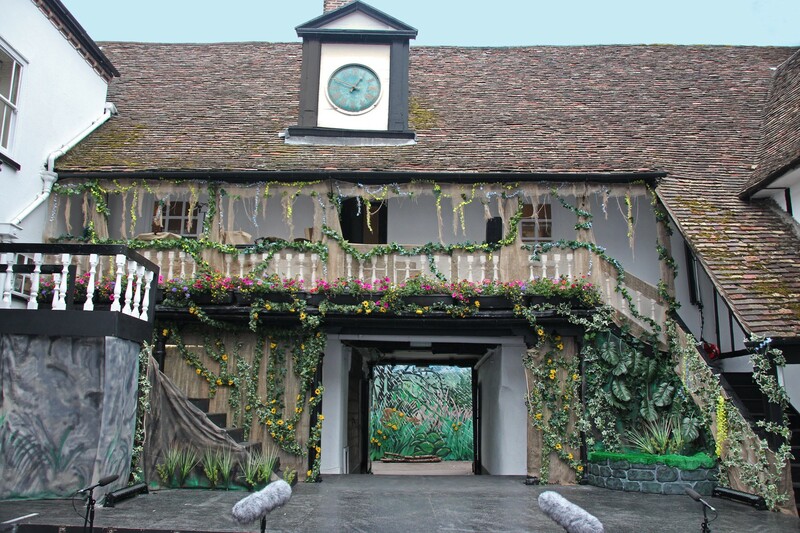 Shakespeare at the George is a registered Charity overseen by a Board of Trustees who ensure that it continues to support and promote local theatre and the arts through the distribution of bursaries and involvement in a number of community projects and events. Our current Patron is Dame Norma Major, who is very supportive of all our works. Over the years many local and national businesses have given their support, both in terms of goods and services, loans of props and financially, and we are very grateful to them all. Special mention should be made of the support and assistance of Greene King, the owners of the hotel and the staff and management who allow this unique experience to take place while running a working hotel and restaurant and without whom none of this would be possible. In 2013 we were fortunate enough to be invited to participate in the Open Stages run by the Royal Shakespeare Company (RSC). This involved 2 years of courses, workshops and classes from RSC practitioners in Directing, Acting, Stage Management, Lighting Music, Movement, Voice and Stagecraft. Following a successful run at The George, the RSC subsequently invited us to perform excerpts from our 2013 production of The Merchant of Venice at the RSC’s Swan Theatre in Stratford and again later on the RSC Main Stage, a thrilling experience for all those involved. Although our main summer production is always a Shakespeare play, since 2014 we have also expanded our repertoire to include SaTG in The Parlour, created to broaden the range and accessibility of SaTG productions. The Parlour concept allows us to provide high quality local drama at other times of the year, in more intimate settings. The first of these was Noel Coward’s Blithe Spirit – performed in the Manchester Room at The George Hotel in 2014 – and since then we’ve also performed The Nativity in St Mary’s Church, Hunts and The Diary of Anne Frank in All Saints Church. As well as this year’s summer production of A Midsummer Night’s Dream, we’ve got lots planned to help us celebrate our anniversary, including the publication of a souvenir book recording the history of the company and the world premiere of a brand new play co-written by William Shakespeare himself! To keep up to date with all that’s going on, keep checking on our website and don’t forget to follow us on Facebook and twitter. As part of our 60th anniversary celebrations this year, Lynne Livingstone has created a brand new work based on the words and plot devices found throughout Shakespeare’s plays. Shakespearean is a one-act play formed entirely from lines found in each of his 37 plays to create a whole new story – at once fresh and yet strangely familiar. With it’s world premiere at The Bridge Festival, Shakespearean features scheming royalty and passionate lovers engaged in cross-dressing, mistaken identity and a happy ending! In addition, we will be performing Shakespearean as part of a special ‘dinner and show’ event at The George Hotel, Huntingdon, on Friday 12 April. More details, including how to book tickets, will be available very soon (watch this space). Shakespeare at The George updated their profile picture. Shakespeare at The George is with Richard Brown and 8 others. 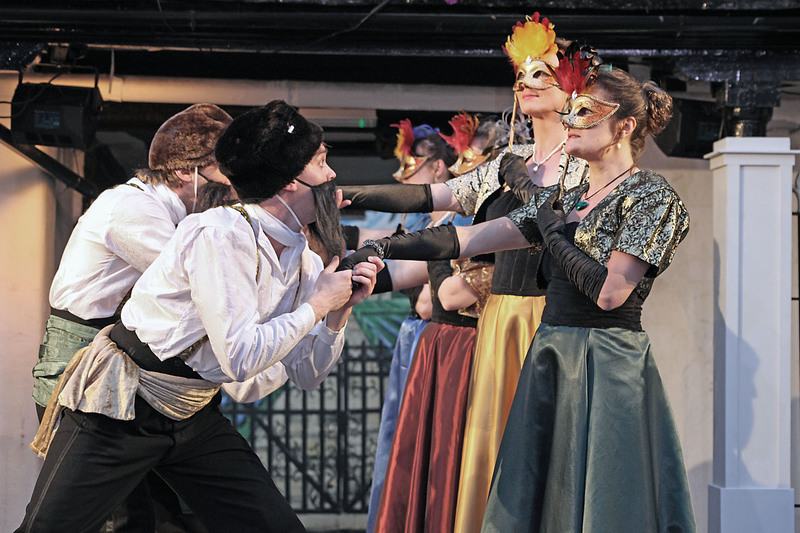 Fast forwarding to Act 5 for tonight's rehearsal where we find Quince and his 'Rude Mechanicals' entertaining the court with the merry & tragical tale of Pyramus & Thisbe. Shakespeare at The George is at George Hotel, Huntingdon.